A few words of advice for Smriti Irani's critics before we discuss her speech in the Lok Sabha. Stop making fun of Smriti Irani for her education (or the lack of it) or her background as a model and TV actress. If these are your only points of criticism against her, then be assured that you have already lost the battle. Irani is emerging as one of the smartest politicians in the country today. Her allegedly fake Yale degree or her role as Tulsi in Kyunki Saas Bhi Kabhi Bahu Thi are non-issues. In fact, they divert us from a much more significant reality - that Irani has become a new voice of Hindutva. 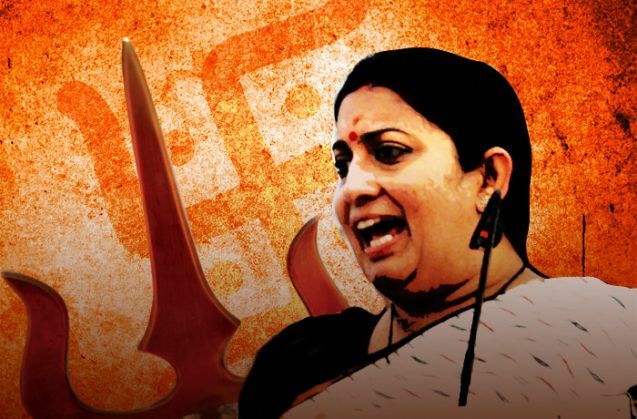 The HRD minister is a far more dangerous voice than the likes of Yogi Adityanath and Sakshi Maharaj who look like half-witted, roadside rabble-rousers in front of her. And if she continues to grow in this direction, they may soon have to shut shop and go back to their respective mutts. Nothing exemplifies the rise of Smriti Irani more than her speech in the Lok Sabha on 24 February. She not only defended herself and her government in the JNU and Rohith Vemula controversies, but launched an all out ideological war against the secular and liberal sections of the polity. "I looked at the case as the death of a child and not as the death of a Dalit. I am enraged by the manner in which a child's death (Rohith Vemula) is being used as a political weapon. I am angry today because the mother who gives birth is accused of murder. I am taking it personally." Irani's voice quivered even as she uttered these words. She claims to have felt a certain maternal pain at the death of Rohith Vemula, whom she refers to as a child. Where was this maternal pain when her ministry forwarded 4 letters to Hyderabad Central University accusing Vemula and his friends of "anti-national" activities? The fact that she forwards petitions from MPs from non-BJP parties is no excuse for her ministry's role in the Rohith Vemula episode. Where was this maternal pain when Vemula was suspended by the HCU and his scholarship withdrawn, preventing him from supporting his family? Irani must remember that Rohith was suspended following a complaint by the ABVP, the student wing of her party. And it is this suspension and the withdrawal of the scholarship that were the immediate reasons for Vemula's suicide. In her press conference on 20 January, Irani said that the entire issue is not a forward versus backward one, because Bandaru Dattatreya, the MP who wrote letters accusing Vemula and others of being anti-national, is also an OBC. If indeed Irani was saddened by Vemula's death, why is she defending the man who was hell bent on maligning this "child"? And if the issue is not about caste, why is Dattatreya's OBC status relevant? Less than a week after Vemula's suicide, Irani's party colleague - BJP general secretary P Muralidhar Rao - alleged that the scholar wasn't a Dalit at all. He said that both Vemula's parents were Vaddera OBCs. He also said that the Ambedkar Students Association (ASA), of which Vemula was a part, was involved in a "Hate India campaign". This was a clear attempt by Irani's party to malign the deceased scholar and project him as an anti-national. Irani now expresses great agony at the politicisation of Rohith's death. But who actually politicised Rohith Vemula - Bandaru Dattatreya and Irani's ministry which branded him as an anti-national? Muralidhar Rao - who practically calls Vemula a traitor, as well as a liar for claiming to be Dalit? Or the political parties and organisations that are demanding justice for him? Yes, Irani is right that Dalit students committed suicide even when the UPA government was in power. But not one of these students was being hounded as an anti-national by politicians from the ruling party. In her speech, Irani took great pains to build a case against Kanhaiya Kumar, Umar Khalid, Anirban Bhattacharya and other JNU students accused of sedition. She read out a number of pamphlets and other document to buttress her argument and present these students as traitors. In the process, Irani is creating precisely the same conditions that had driven Vemula to take his own life. No maternal sympathies here. Kanhaiya Kumar, for instance, is from a family as poor as that of Rohith Vemula. His studentship has been revoked, at least for the time being, and he won't be able to send money to his family. If Vemula was accused of being an anti-national, the campaign against Umar Khalid goes even further as it accuses him of being a terrorist with links to Pakistan based terror outfits. Aren't Irani and her government driving Kanhaiya, Umar and others the Rohith Vemula way? Does one of them have to kill himself like Rohith to remove the "anti-national" tag and evoke Irani's compassion? One of the proofs that Irani offers of the JNU students' anti-national activities is that they organised the Mahishasura Martyrdom Day on campus, hailing the "demon" killed by Durga. Firstly, Irani is conflating organisations here. The Mahishasura Shahdat Diwas that Irani is referring to was organised in October last year on the same day as Vijay Dashmi. It was organised by the All India Backward Students Forum and not the students who have now been booked for sedition. Secondly, even if these students did commemorate Mahishasura's martyrdom at the hands of Durga, how can that be used to justify the sedition case against them? According to an Indian Express report from 2014, Mahishasura's "martyrdom" was observed by tribals and backward communities in 15 districts spread across 5 states - Uttar Pradesh, Bihar, Jharkhand, West Bengal and Odisha. They say that he was a just, non-Aryan king who was maligned as a demon by the Aryans. Certain Dalits in Mysore also have the same belief. There, some of them even assert that he was a Buddhist king. Also read-Nation wants to know: How can 2782 boys in JNU use 3000 condoms daily? In Telangana, a section of Adivasis and Dalits worship Narakasura, who was slain by Vishnu a day before Diwali. They believe he was of Dalit and Dravidian lineage. In Kerala, people still celebrate Onam to welcome King Mahabali who was buried alive by a Brahmin avatar of Vishnu. If this is an act of sedition, then Kerala would have seceded by now. The point here is that mythology, especially in an amorphous religion like Hinduism will always have multiple perspectives. Unfortunately, this is something Irani won't be able to understand. She comes from an ideological school that sees Hinduism as a monolith and wants to remove the heterogeneity within it. Even worse, it conflates Hinduism with the Indian nation. This explains why Irani feels that commemorating Mahishasur's "martyrdom" is anti-national. Incidentally, Irani isn't the first to find such a commemoration anti-national, nor are the JNU students the first to be attacked for it. Rohith Vemula, whom Irani refers to as a "child", and the ASA were accused of exactly the same thing, by none another than Irani's saffron comrade Muralidhar Rao. "Organising Beef Festival, celebrating Mahishasura, Hiranya Kashyap, conducting prayers for Yakub Memon's death, supporting terrorism in various parts of the country shows what these organisations stand for...Ideologies which want to see India as weak are promoting 'divide India campaigns'. ASA in HCU is part of this chain," Rao had said. "I am not certifying your patriotism, but do not demean mine. I am not certifying your idea of India, but do not demean mine." Irani said during her speech that she is not in the business of issuing certificates of patriotism. This couldn't be farther from the truth. Giving certificates of "anti-national" or "nationalist" appears to be the favourite pastime of everyone in her party and its extended family. ABVP assaults and bullies anyone it deems to be anti-national as does a leader like Delhi MLA OP Sharma. MPs Maheish Girri and Bandaru Dattatreya hound students calling them "anti-national" by filing complaints which are duly followed up by ministers like Irani and Rajnath Singh. Giriraj Singh wants to send anyone who opposes Narendra Modi to Pakistan, Mukhtar Abbas Naqvi wants anyone who eats beef to go to Pakistan. During her speech Irani said that Rahul Gandhi attended a rally in support of anti-nationals in JNU. The rally that Irani refers to was attended by more than half of JNU. Are they all anti-national in her opinion? Perhaps for her, the only patriots present at the rally were the ABVP supporters who attacked Rajya Sabha MP Anand Sharma. "Yeh vandan ki dharti hai, abhinandan ki dharti hai / Yeh arpan ki bhoomi hai, darpan ki bhoomi hai / Ki nadi nadi humaare liye Ganga hai, iska kankar kankar humaare liye Shankar hai / Hum jiyenge to iss Bharat ke liye, marenge to iss Bharat ke liye / Aur marne ke baad bhi, Gangajal mein behti huee humaare asthiyon ko koi sunega, to ek hi awaz aayegi - Bharat Mata Ki Jai." So her definition of Indian is someone for whom every pebble is Shankar, someone who, after death, will be flowed in the Ganga in the form of ashes saying "Bharat Mata ki Jai". No prizes for guessing who this definition includes and whom it excludes. Irani's speech makes it evidently clear that for the BJP, Hinduism is integral to nationalism. The JNU and Rohith Vemula cases show that the party is willing to use its administrative clout to silence those who oppose this conflation. Irani and her party will create more imaginary asuras to be slain at the altar of nationalism.